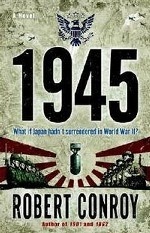 Аннотация к книге "1945: A Novel"
America has dropped atomic bombs on Hiroshima and Nagasaki. But Japan has only begun to In 1945, history has reached a turning point. A terrible new weapon has been unleashed. Japan has no choice but to surrender. But instead, the unthinkable occurs. With their nation burned and shattered, Japanese fanatics set in motion a horrifying endgame – their aim: to take America down with them. In Robert Conroy’s brilliantly imagined epic tale of World War II, Emperor Hirohito’s capitulation is hijacked by extremists and a weary United States is forced to invade Japan as a last step in a war that has already cost so many lives. As the Japanese lash out with tactics that no one has ever faced before – from POWs used as human shields to a rain of kamikaze attacks that take out the highest-value target in the Pacific command – the invasion’s success is suddenly in doubt. As America’s streets erupt in rioting, history will turn on the acts of a few key players from the fiery front lines to the halls of Washington to the shadowy realm of espionage, while a mortally wounded enemy becomes the greatest danger of all.